The city of Los Angeles has just broken records by becoming the largest city in the United State to adopt a mandatory sustainability program. An article on Multi-Housing news reports that the legislatures of Los Angeles’ City Council voted to require new developments over 50,000 square feet to be 15% more energy efficient over current California code standards. Apparently they were feeling especially pro-environment this year on Earth Day was the day that they unanimously voted in favor of the sustainable initiative. This is a huge step in the right direction in the city’s Green Building Program, and hopefully they will set the example for the other big cities in the nation. Once the new ordinance takes effect, which is sometime in November, the city’s carbon emissions will be reduced by more than 80,000 metric tons annually – to give you a better picture, this is the equivalent of removing 15,000 cars off of the road every year! Way to go L.A.! 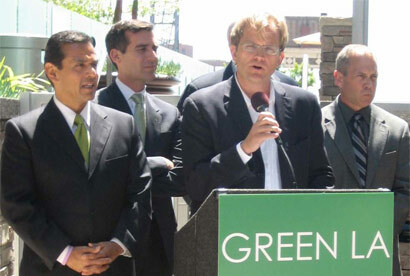 This entry was posted in Energy Efficient, Green Building Legislation and tagged building green, Energy Efficient, Green Building Program, sustainable initiative on May 6, 2008 by Carol Morgan.